Find out more about open studio’s in 2019! The Dooyewaard Award is an annual prize for outstanding young Contemporary Artists at the time of their graduation from Art College. The artists are selected by a jury, made up of board members of the HKU and an independent jury of curators and members of the Dooyewaard Foundation. read more about all award winning artists. The largest of the three studios, considered the Theo Lohmann studio, also claims a noteworthy history. 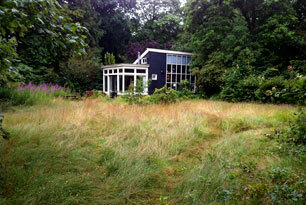 Lohmann bought it in 1924 from Jurriaan van der Vliet a Laren resident “ for amotion” to his plot at the Schapendrift. The studio was situated in Laren amidst…, read more…. The Dooyewaard Foundation has recently acquired a plot of land and buildings in Blaricum in order to preserve a group of remarkably authentic studios from the beginning of the 20th century. One of the studios from about 1905 was used by Piet Mondrian in the summer of 1917, a crucial period in his artistic development. 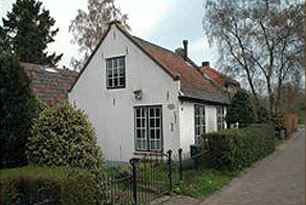 Another wooden building turned out to have been the studio of painter Ferdinand Hart Nibbrig and Anna Sluijter thereafter. The Foundation aims to restore all these buildings and will replace three wooden studios to a different location on the premises using the traditional method of lifting them up. Watch the documentory about the restaurationproject! They will be placed back onto newly created cellars in order to combine modern living standards with early 20th century exteriors. 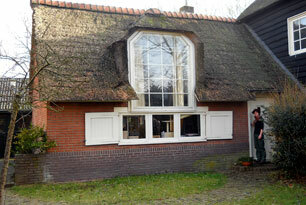 Dooyewaard Foundation fulfills its aim of promoting Blaricum as a village of artists. The Foundation aims to set up a thriving art colony which ideally would be part of an international chain of artists’ colonies where artistic spirits can flow and prosper. Potential sponsors and supporters are encouraged to contact the chairman of the Dooyewaard board. 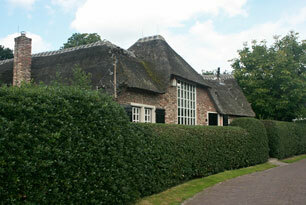 In order to promote local art culture the Dooyewaard Foundation was, for a ten year period (1993-2003), allowed to use the original studio of Willem Dooyewaard at the Gebroeders Dooijewaardweg in Blaricum. 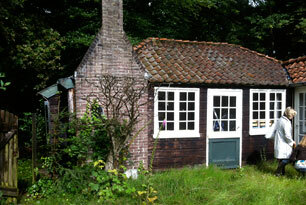 This studio is located in the garden of the original studio house built in farmhouse style which has been used for decades by brothers Jacob and Willem Dooyewaard. These buildings under their original name “The 7 Limes” are now private property.